When the commits are pushed to GitHub, the CI runs and after passing the tests it triggers the following npm run semantic-release script run. Again, all this happens automatically. There is a small problem when using semantic release. Since I no longer execute npm publish locally (the CI server does this after the build), there is a delay between the time I push the commits to the remote origin and the time the new version gets published. Usually I check the github interface to see when the tag appears. The browser page reload and waiting is very annoying. I want a way to be notified when the new version has been published, and the message should include the beautiful release notes too! publishes a message to a Slack channel. There three API to connect, plus we need to run the server somewhere. Long time ago, I deployed a simple server like this to Heroku. I used a free dyno, which was great for simple demos. Yet for this project a free dyno does not work very well - the free dyno can go to sleep, ignoring the incoming message. Plus, there is a little bit too much overhead in setting a simple application like this on Heroku. Recently, I have tried using Dokku on a single DigitalOcean droplet. I love Dokku - I can host multiple Docker images on a single box, there are plugins for different databases, things just work. It also makes perfect financial sense - a single $10 droplet can run 10-20 apps, and as long as none is very CPU expensive, the apps keep chugging along. Yet, even the Dokku requires manual setup. Is there something simpler? Enter Zeit. Advertised as making cloud computing as simple as possible, it has certainly provoked a lot of interest among the web development crowd. This project was my opportunity to try it out. I had to go through these hoops because the NPM Slack example uses Web API to post messages (via @slack/client package). I would prefer using a Webhook instead via slack-node package. Maybe in the future I will make the switch. To grab the GitHub release notes from public repos, we do not need much - just your GitHub user name. In order to get release information from private repos you need to make a personal access token with "repo" scope. Finally, in order to subscribe to NPM events, you need to be a paying customer, install "wombat" CLI app using npm i -g wombat and login. To ensure secure delivery, you need to set a secret pass phrase when making each hook. For example no one knows what it's like... is a good shared secret for this experiment. We can export these variables before running the server. In the future, I will show a better way to handle the environment variables using as-a. // All hook events, with special handling for some. We can refactor the code, and even remove the unnecessary event handles, since we are only interested in package:publish event, etc. For now, let us connect the local server to the NPM registry hook. After receiving the package:publish event, the code fetches the latest GitHub release notes and sends them as a message to a Slack channel. Let us start by running the server locally. Before we deploy this code, let us start by testing the server code locally. Of course, in this case we get the server running at http://localhost:6666, which is not reachable from external clients. Let us tunnel to the local server using ngrok. Notice we are getting both http and https forwarding. Let us register the NPM hook. I will observe a repo of mine little-store. $ wombat hook add little-store https://743e560f.ngrok.io/incoming "no one knows what it&apos;s like..."
To trigger the release, let us push a few dummy commits to the repo bahmutov/little-store. Even dummy commits would do, as long as we follow the semantic version commit format. $ git commit --allow-empty -m "feat(dummy): this is new feature"
$ git commit --allow-empty -m "feat(dummy): this is another new feature"
$ git commit --allow-empty -m "fix(test): just fixed a bad bug"
The Travis CI build has finished and has determined the new published version 1.2.0, generating the release notes. The request body has the event and the package information. From the payload we can grab the repo, and if it is hosted on GitHub, make a request to grab the latest release notes. Since Slack does not follow Markdown, we need to convert the incoming message to the Slack format. 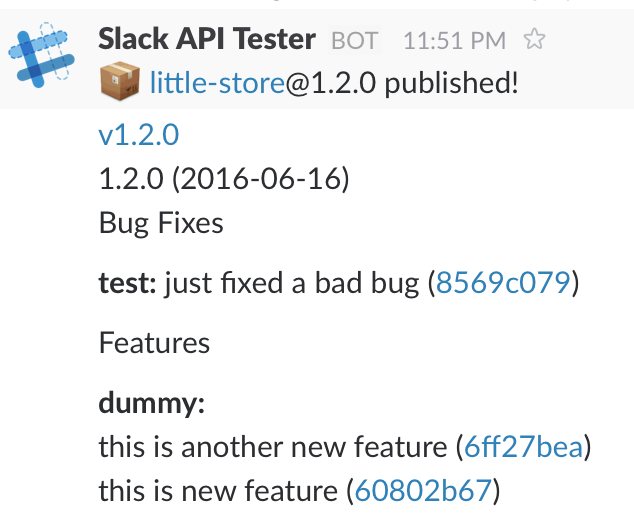 I just do 2-step transformation Markdown -> HTML -> Slack format using marked and slackify-html. Now we can remove the NPM hook used for the local environment and deploy the permanent external server. The two best features about deploying using zeit now are simplicity and speed. You also get a unique url for each deployment - you can test the deploy, and only if it works switch a domain alias to point at the unique url. First, start by installing the tool now and logging in. Hmm, the server throws an exception when trying to start. Seems it cannot find the environment variables we are using! Currently the now tool does not support the environment variables, thus we need to pass them inside the npm start script. "start": "SLACK_API_TOKEN=xoxp-... SLACK_CHANNEL=C1... ... node index.js"
"start": "as-a slack,npm,github node index.js"
We can deploy the server using now and it will give us a unique URL. I will use -f option to force a clean install. 18 seconds for a clean install, but if there are no dependency changes, or even code changes, the install takes a lot shorter. Nice! We can register an NPM hook with the given url, test it out, and then remove any unnecessary deployments. $ wombat hook add little-store https://release-to-slack-fcwdzcxyev.now.sh/incoming "no one knows what it's like..."
Let us remove the older deploy dFDDV9Da9lWeVpCitEj1znMY. That is it. Zeit truly delivers on its premise of simple cloud computing, and there is even an API to automate the deployments. Finally, I have open sourced the server at bahmutov/publish-release-notes. Because the deploy needs the environment variables to be present, I have created a separate private repo that keeps just .as-a.ini file and defines the start command. This way I can keep my tokens private for deploy, but the 99% of the code is open source. Once zeit supports external environment variables, this wrapper project will become unnecessary. Creating personal "API to API" bridges has never been easier. Webhooks, notification messages, well documented APIs and one-click immutable deployments are breaking down the barriers to incremental software development. Instead of waiting for a large number of changes to be ready to deploy and test, I commit, test and deploy each tiny change - because the entire code deployment pipeline is simple to setup and use. Instead of manual sitting and waiting, each step notifies whoever is listening that it is done, allowing the quick propagation. In a sense, we now can build a reactive pipeline for code, removing the manual pull steps.